When it comes to most premium quality Smartphone, ‘A’ series just comes after ‘S’ and ‘Note’ series Smartphone from the Samsung. in this Series Samsung Galaxy A8 released in market with features like Snapdragon 615 Octa-core processor, 5.7 inches display, 16 MP rear camera, Fingerprint sensor, 2 GB RAM, 32 GB ROM, 128 GB Expendable Memory and 3050 mAh battery. 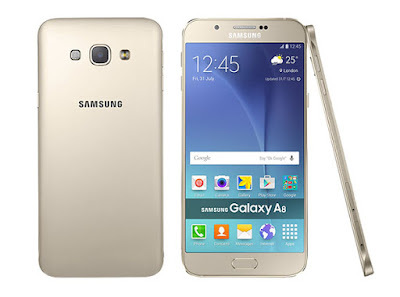 Here we will have Short review, Pros and Cons of Samsung Galaxy A8. The Samsung signature design having slight modification in corners with metallic edges and frame looks great. The back cover is plastic made; that we expected to be metallic. Matte texture doesn’t seem flex make its design looks more premium as this handset is only 5.9 mm thin. SIM card slots and volume keys are along the left edge and the power key is on the right edge, USB and 3.5mm ports are at the bottom and top has only a microphone for the video camera and voice recorder. Qualcomm MSM8939 Snapdragon 615 with 1.8 GHz Octa-core processor and Adreno 405 GPU this hardware combination clearly able to run smoothly even after loading handset with many applications. But sometime phone faces heating near Camera but it’s up to affordable range. 5.7 inches Super AMOLED capacitive touchscreen with Full HD resolutions and 386 ppi display density is bright, sharp and detailed. 386 ppi display density seems low as compare to other Smartphone of this price segment but display is quite vibrant. Thanks to AMOLED technology that is providing wide viewing angle with that clearty. 16 MP rear and 5 MP front camera both featuring f/1.9 aperture, the photographs taken from the primary camera in normal lightning condition are providing detailed information about the picture. Wide Selfie function gives you a huge 120° view that is able to cover a good impressive selfies. 3050 mAh battery is neither disappointing nor so impressive but it can run up to one full day. Ultra power saving feature can be more useful. Excellent camera (Both rear & front). Beautiful 5.9 mm thin slim design and premium look. Battery charges faster than many handsets. Uses hybrid SIM slots; means you can either use SIM 2 or Micro SD card. This handset is just below the Samsung Galaxy S6 in few area, but all the features are nearly same; but i will not suggest it to someone that is interested in More Data storage. This handset is not waterproof as Moto G3 and Sony Xperia M5. However its eye catching design, smooth performance and camera is superb.